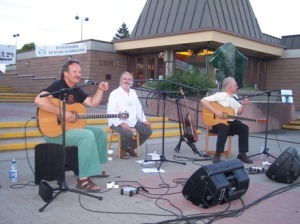 An eclectic mix of jazz, folk, rock, and blues, performed on acoustic guitars, accompanied by spot-on vocals best describes this trio. Neil Fraser pulls notes out of his acoustic like his fingers were on steroids. Shelby Wall makes his instrument sound like a complete band, yet never gets in the way of Neils playing. John Lent, the main vocalist, has a voice that gives the listener a musical window directly to his soul. 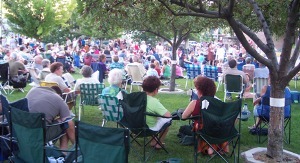 Families, with young in strollers, or sitting on blankets, people complete with the ever popular folding camp chairs, are spread out, enjoying the music as night falls. There is no better sense of community than to enjoy music, sitting on the grass under the stars. 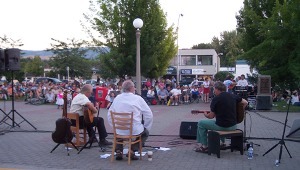 The summer music series on the steps of the Library gathers people of all ages from round the valley to enjoy their favorites. Ranging from one end of the spectrum to the other, there is something for everyone over the Thursday evenings that the series is offered.